History Of Hanover Event This Sunday August 30 | Virginia Right! Please join Delegate Chris Peace this Sunday August 30, 2009 from 3PM to 6PM and be one of the first to explore the rich history of Hanover County. This makes an excellent Christmas gift as well as a beautiful book to add to your personal collection. Hanover County is the cradle of Liberty and has done so much to influence the growth and direction of the country from the very beginning. Chris Peace is one of the more knowledgeable people you will ever meet, especially on the topic of Hanover County. 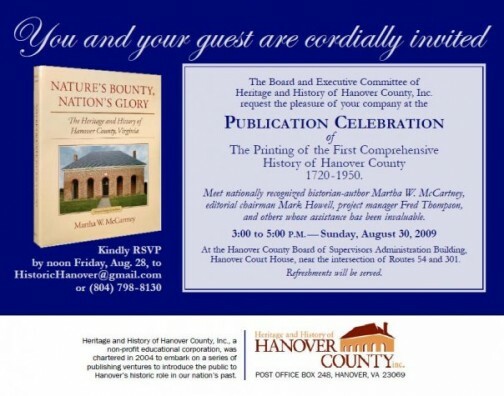 Refreshments will be served and the Hanover County Administration Building, located in Historic Hanover is an appropriate setting for the release of this work. Contact [email protected] for more information, or to R.S.V.P.